In 2016, the closed season for Murray cod during the months of September, October and November will not apply at Lake Eildon. The closed season will still apply in all other Victorian waters. Murray cod are an iconic native fish, highly valued by recreational anglers. More than one million Murray cod fingerlings were released into Lake Eildon between 2010 and 2013, complementing the existing population developed from decades of smaller scale releases. Fish population surveys and angler reports indicate Lake Eildon is emerging as a high quality mixed fishery with a growing population of stocked native fish, including Murray cod. In 2014, Fisheries Victoria changed recreational fishing regulations for Murray cod based on extensive research and feedback from anglers. The minimum size was changed from 60 to 55 cm and the maximum size changed from 100 to 75 cm. Bag limits were reduced to 1 fish per day in rivers and remained unchanged at 2 fish per day in lakes. In 2015, a large-scale research project assessed the stocking success of Murray cod (and golden perch) in several lakes and rivers. It found that in Lake Eildon, 99.6 per cent of Murray cod were from stocking, indicating that natural recruitment was very low. 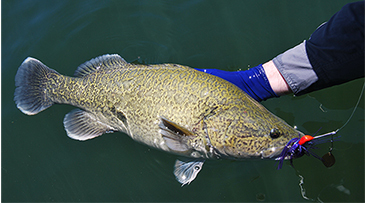 A closed season is intended to protect breeding Murray cod. This is not relevant to Lake Eildon where breeding success is minimal. The Lake Eildon Murray cod fishery is primarily reliant on fish stocking ie. it is managed as a stocked 'put and take' cod fishery. Removing the cod closed season at Lake Eildon will create new spring-time fishing opportunities. Fishing participation and associated tourism in the region is expected to increase, which is consistent with the State Government's Target One Million plan that aims to get more people fishing, more often. The change mirrors a New South Wales decision to remove the Murray cod closed season at Copeton Dam, which has proved popular with anglers and fishing dependent businesses. Like Lake Eildon, research found most of Copeton's Murray cod were stocked fish and not the offspring of wild Murray cod. This initiative will be trialled over 12 months.